Donald Trump took office as the 45th president of the U.S. on Friday, delivering a speech that promised sweeping changes and used sharp rhetoric to take aim at the Washington establishment. Donald Trump, now the 45th president of the United States, promised that he would work tirelessly for every American and vowed to put "America first." Now that Donald Trump is president, having been sworn in as the nation’s 45th president, here’s a guide from CBS News on the top Trump-related issues to keep an eye on going forward. Police fired tear gas on the streets of Washington, D.C., and arrested at least 95 people as protesters angry over the inauguration of President Donald Trump smashed windows of businesses, upended trash cans and scuffled with cops. As Donald Trump is inaugurated as 45th president of the United States, NBC News takes a glance at what people around the planet — from world leaders to ordinary citizens — are saying about America's new leader. Donald Trump became the 45th President of the United States Friday, vowing to drain power from Washington elites and always put "America first" in its dealings with the world at a moment of transformative political change. Donald Trump was sworn in as the 45th president of the United States Friday, taking the helm of a deeply divided nation and putting Republicans in control of the White House for the first time in eight years. Donald John Trump was sworn in Friday as the 45th president of the United States, taking office on a day that has featured smaller crowds and more subdued ceremony than previous inaugurations — but still ushers in a transformative shift in the country’s leadership. Five hundred and eighty-four days after descending his Trump Tower escalator to announce his candidacy, Donald J. Trump took the oath of office Friday to become the 45th president of the United States. 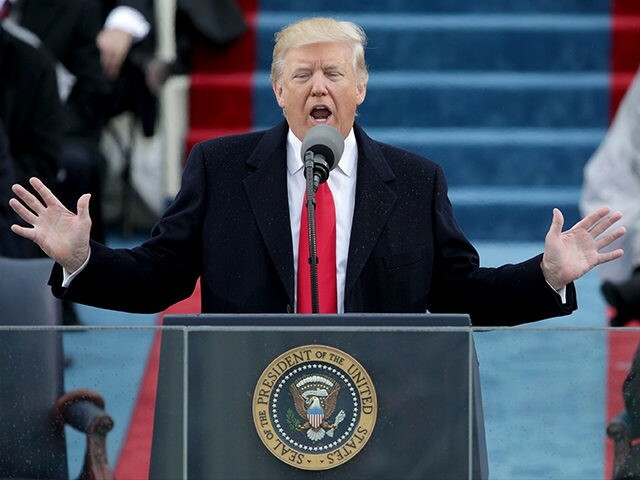 In an unabashedly populist inaugural address, President Donald Trump hammered the established Washington order and sold himself as the voice of the “forgotten men and women,” and a redeemer to a country he described in strikingly dark tones.